Castleford Tigers boss Daryl Powell admits it will be a big challenge for his team to back up their much improved performance of last week when they travel to Warrington Wolves tomorrow. 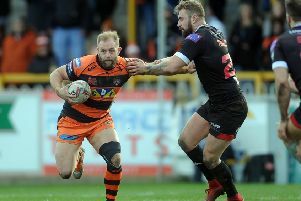 The Tigers turned round a big loss to St Helens with a 42-14 win at Hull KR, but face another big test of their table topping credentials when they now face a side fresh from nilling Wigan to go into the Challenge Cup semi-finals. Their task has been made harder as they will be without three injured half-backs as well as four other members of the first team squad. But rather than concentrate on the negatives, head coach Powell is seeing it as an opportunity for players to force themselves into the reckoning. He told the Express: “We’re not helped with our injury list at the moment, but I’m not making any excuses, it is what it is. “We’ve been through tough times before and it gives opportunities to other players. “Q (Laulu-Togaga’e) is going to play, for example, and obviously Kieran Gill played last week. “It just gives other chances for players to step up. “We’re just looking to try and build some consistency now. “That relies on individual players playing well more often than they are at the moment. “Hopefully we’ll see a step in the right direction for us this week. On the new injuries, Powell explained: “Liam Watts injured his calf last week and he’ll be missing, but again there will be an opportunity for another player to come into the 17 and play well. “Jamie Ellis injured his back so we’ve got three half-backs missing with Ben Roberts and Luke Gale already out. “You don’t have an awful lot of half-backs on your roster so that’s going to make it very difficult for us. “Jake Trueman’s going to lead us in that regard and he’s a young rugby league player.